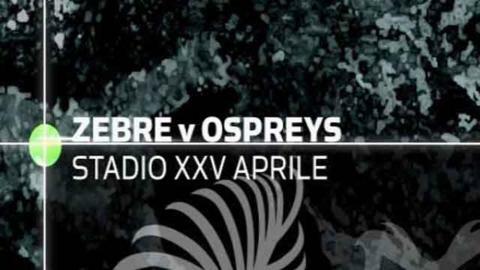 The Ospreys beat the league's new boys Zebre in Italy to record their third straight victory in the Pro12. The reigning champions have now beaten Zebre, the Scarlets and Munster, and put their dismal start to the campaign behind them. Full-back Richard Fussell, number eight Jonathan Thomas and fly-half Dan Biggar all crossed for tries for the Ospreys. Biggar also enjoyed a decent game with the boot and finished the game with a personal tally of 24 points. The Ospreys' victory was never really in doubt and the visitors went into the break 21-6 ahead, banishing memories of their last trip to Italy. The Welsh side suffered their first defeat to an Italian side when they were beaten 12-6 by Treviso in Italy in their season opener. But the return of Wales and British and Irish Lions tight-head prop Adam Jones, making his first start of the season, was another major boost. Full-back Richard Fussell scored the game's first try after he finished of a simple passing move with the Zebre down to 14-men after scrum-half Alberto Chillon had been shown the yellow card. Biggar added the conversion before Thomas crashed over for the Ospreys' second try just before half-time, extending their lead to 15. Zebre, who replaced Aironi as the second Italian side in the league for this season, gained their first point last Friday in a 19-22 defeat at Glasgow. And they did claw themselves back into the contest in the second half, when prop Luca Redolfini crossed for the Parma-based side after a well executed blindside move left the Ospreys defence flat-footed. Australian full-back Danile Halangahu kept the scoreboard ticking over before Biggar replied with the Ospreys third try, which he converted, to make sure of a victory which puts their domestic season back on track. Zebre: Daniel Halangahu; Giovanbattista Venditti, Matteo Pratichetti, Gonzalo Garcia (capt), Sinoti Sinoti; Alberto Chiesa, Alberto Chillon; Matias Aguero, Davide Giazzon, Luca Redolfini, Quintin Geldenhuys, Michael Van Vuren, Emiliano Caffini, Mauro Bergamasco, Andries Van Schalkwyk. Replacements: Replacements: Benettin for Chiesa (51), Sole for van Vuuren (41), Festuccia for Giazzon (51), Perugini for Aguero (41). Not Used: Tripodi, Ferrarini, Martinelli, Sarto. Sin Bin: Chillon (24), Pratichetti (61). Ospreys: Richard Fussell; Hanno Dirksen, Ashley Beck, Andrew Bishop, Eli Walker; Dan Biggar, Kahn Fotuali'i; Ryan Bevington, Scott Baldwin, Adam Jones, Alun Wyn Jones (capt), Ian Evans, Ryan Jones, Sam Lewis, Jonathan Thomas. Replacements: Replacements: R. Jones for Fussell (74), Webb for Fotuali'i (51), D. Jones for Bevington (52), Jarvis for A. Jones (44), Stowers for R. Jones (68). Not Used: Dwyer, Bearman, Spratt.